Fathom Events and National Theatre is presenting the production in select U.S. cinemas. 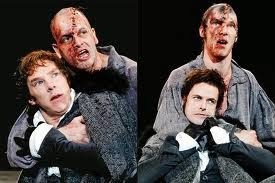 Staring and alternating Dr. Victor Frankenstein and the Creature will be Benedict Cumberbatch and Jonny Lee Miller so audiences can see both of them playing both parts. The pair earned a joint Best Actor award at London’s Evening Standard Theatre Awards. 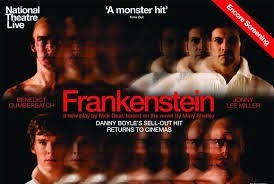 Danny Boyle produced the show that was written by Nick Dear and the performances were brilliant and mesmerizing. We follow the creature’s pain as he bursts on the screen naked as he yearns for true love and a female companion.